A heartfelt thanks to each of you who posted messages in the guest book at the time of the NEA award ceremony, and to those who have posted in memoriam. Welcome to the Mike Auldridge Tribute website, celebrating the 2012 award of the National Endowment for the Art’s highest honor, the National Heritage Fellowship, to Mike Auldridge. A major purpose of this site is to provide a place for Mike’s many friends and fans to post a tribute to Mike. We hope you’ll click on the Guest Book link and share your tribute: what Mike has meant to you and your music, your reflections on his contributions and influence, stories, anecdotes, or whatever you would like to share. Visit the NEA’s bio page for Mike to read more about Mike and hear sound clips of some of his music. In 2007, the International Bluegrass Music Association presented Mike with its prestigious Distinguished Achievement Award. Visit this page to read the text of Rob Ickes’ presentation of this award to Mike. The influence Mike has wielded is incalculable. From the moment his first solo album, Dobro, was released in 1972, the very sound of the dobro was indelibly and profoundly changed. To borrow from Steve Martin’s assessment of Earl Scruggs’ influence on the banjo: Before Mike Auldridge, no one sounded like Mike Auldridge on the dobro. After Mike Auldridge, everyone aspired to sound like Mike Auldridge. 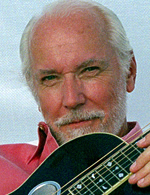 As Rob Ickes noted in his IBMA presentation, “To this day, [Mike’s] tone is the holy grail of contemporary resophonic guitar players.” Rob also particularly noted how Mike stretched the boundaries of the instrument in terms of technique, musical vision and elegant taste firmly rooted in a “less is more” ethic. Thanks for sharing your own tributes to Mike in the Guest Book, and for joining in this celebration of Mike Auldridge and his richly deserved National Heritage Fellowship. Please post comments & tributes on the Guest Book page, rather than here.